In this recipe, the rich chocolate custard-based ice cream is combined with chunks of peanut butter cookie dough. Use mini chocolate chips in the cookie dough if you'd like. 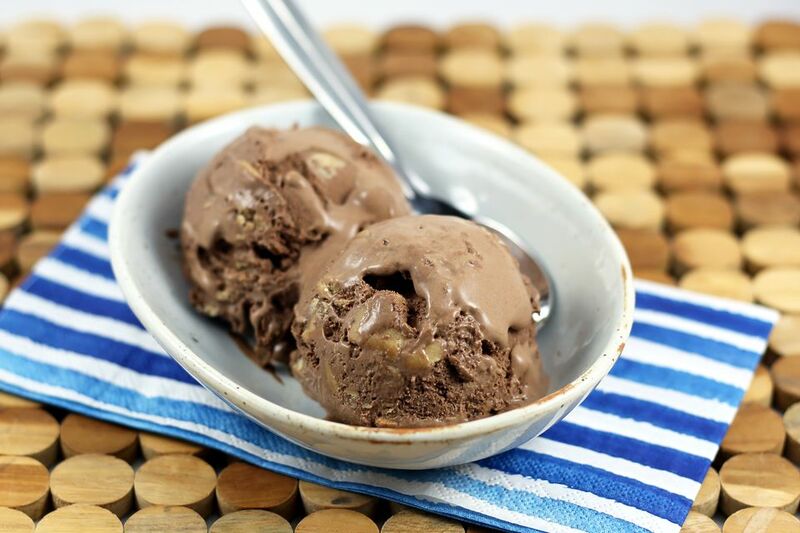 For extra texture, add some chopped roasted peanuts to the ice cream along with the chunks of cookie dough. The chocolate ice cream is made with a cooked custard mixture, so start preparing early so it will have plenty of time to chill. It can be made a day in advance. Use all or part of the cookie dough chunks in the ice cream. If you don't use it all, save it in the freezer for another batch of ice cream. In a mixing bowl with an electric mixer, combine the softened butter, peanut butter, and brown sugar. Beat for about 3 to 4 minutes, until light and fluffy. Beat in the 1 teaspoon of milk, 1/2 teaspoon of vanilla, and the all-purpose flour. Fold in chocolate chips, if using. Place the cookie dough on a sheet of wax paper or plastic wrap. Place another sheet of wax paper or plastic wrap over the cookie dough and pat or roll it into a disk about 1/2-inch in thickness. Place in the refrigerator. In a medium saucepan, whisk the cocoa into 1 cup of heavy cream until smooth and well blended. Whisk in the remaining 1/2 cup of cream, the 1 1/2 cups of milk, granulated sugar, and chopped semisweet chocolate. Place the saucepan with the milk and chocolate mixture over medium heat and cook, stirring, until it just begins to boil. Remove the pan from the heat. Gradually whisk about 1 cup of the hot custard mixture into the egg yolks. Pour the egg yolk mixture into the hot custard mixture in the saucepan and whisk to blend thoroughly. Place the pan over medium-low heat and continue to cook, stirring, until the mixture coats the back of a spoon (see tips), or to about 175 F to 180 F on an instant-read thermometer. Stir in the 1 1/2 teaspoons of vanilla extract. Place a fine-mesh sieve over a bowl and strain the hot mixture into the bowl. Let the chocolate mixture cool to room temperature. Place the bowl in an ice back to cook more quickly. Cover the bowl with plastic wrap and chill for at least 3 hours or overnight. Slice the disk of cookie dough into small chunks. Put the cookie dough chunks in a container and put the container in the freezer. Following your ice cream machine manufacturer's directions, freeze the chocolate ice cream mixture. Stir the chunks of cookie dough―along with the chopped peanuts, if using―into the ice cream mixture as you spoon it into a container. Cover and freeze until firm. To test the custard for doneness without a thermometer, dip a wooden or metal spoon in the hot custard mixture. Run a finger across the back of the spoon. If the path remains clear and the film of custard doesn't run into it, the custard is done.